So now that I have my grown up car… what should I do with my sports car? 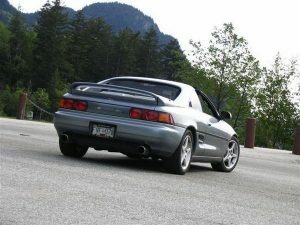 Until recently, I’ve driven an MR2 almost every day for the past 10 years so selling it wouldn’t seem right. I’ve decided to do a full restoration of the car to “new” condition but I don’t know which engine to use. Should I stick to the restoration route and put in a factory 3SGTE or should I go the 2GRFE route? Once the car is restored, I would love to take it on long road trips to Las Vegas again. The thing I don’t like about the 3SGTE is the lack of low end torque, I found the 5SFE powered MR2 to be easier to drive in the city. Because of the torque, the gearing on the transmission is short and as a result, it’s not the best car to use on a hwy. I did a few trips to Vegas in various MR2’s and at 80mph, the engine’s at 4000rpm. That makes it difficult for the passenger to sleep. I’m leaning towards a V6 right now because the extra torque allows for taller gearing in the transmission and I’m hoping at 80mph, the RPM’s would be closer to 2500. On the other hand, a completely factory restoration might be worth some money one day so I’m a little torn between the two. Which ever route I go with the engine, the rest of the car does need to be restored as well… the interior, bodywork, paint, suspension, stereo, etc… I think I’ll start this long weekend by installing those motorized folding mirrors that I’ve had in my closet for several years now.